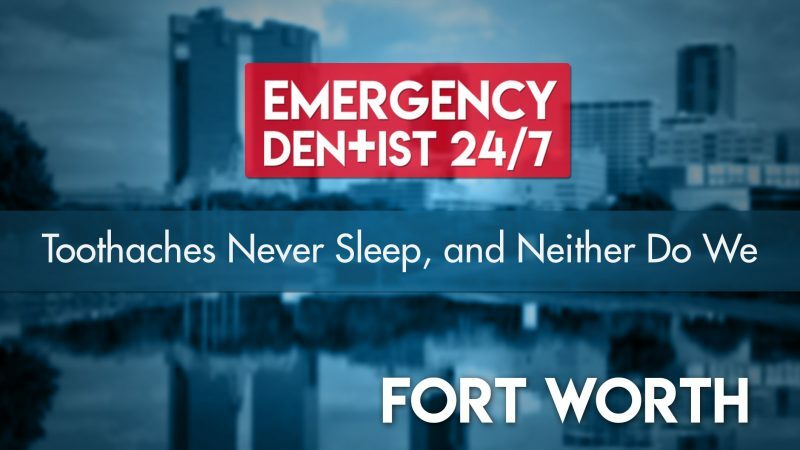 If your toothache has you up late at night on Google trying to track down a Fort Worth emergency dentist, we feel your pain – literally! 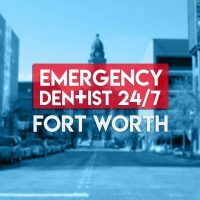 You’re not the first to go through a dental emergency and seek fast relief from the pain by looking up “emergency dentist Fort Worth” at an ungodly hour. Because of this, we’ve created our 24-hour emergency dental referral network. All you have to do is give us a quick call at (817)-484-0787 and we’ll take care of the rest. We can have you booked for an appointment in as little as 24 hours from the moment you place your call, so don’t wait any longer. Now that you’ve given us the task of booking your appointment for you and we’ve taken that load off your shoulders, there are a few things you’re going to need to do before it’s time to go to your appointment. Make sure that you have an acceptable piece of personal identification, such as your driver’s license, for example. If you’ve seen your regular dentist recently and brought home any paperwork, or even a detailed receipt, make sure you bring that information with you, as well. Next, if you’re currently taking any medications or have any allergies you know about, we suggest making a list to give to the emergency dentist and their team. This information is extremely important for them to have. They need to make sure they don’t use anything during your appointment that will cause an allergic reaction or clash with your medication. 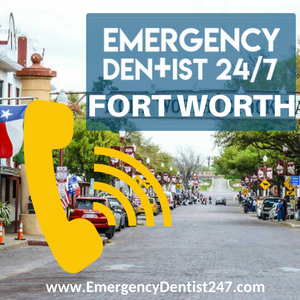 We recommend calling ahead once we call you back with the details of your emergency dentist Fort Worth appointment to check if your dental insurance, if applicable, will be accepted. If you don’t have dental insurance, you should still call ahead and ask for a quote so you’re better prepared. Finally, make sure you arrive at least 15 minutes early to fill out paperwork, ask any questions you may have, and let the emergency dentist and their team know about any fear or anxiety you may have. A fear of the dentist is very common, so they know how to keep their patients comfortable. 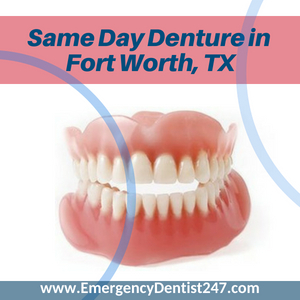 If your dental emergency involves your dentures, you don’t have to Google “emergency denture repair Fort Worth” all night, either! We have a number of emergency dentists who work closely with lab technicians in our referral network. Whether your current set of dentures need repairs done or you need an entirely new set fitted, we can have you booked and looked after on the same day. Dental emergencies always seem to occur when your regular dentist is closed, during a busy day, etc. Some dental emergencies present themselves as an emergency straight away, while others you won’t notice until the pain hits you like a sack of bricks. Severe toothaches, oral infections, and lost or knocked out teeth are all major dental emergencies, especially when it comes to making themselves known. Loose braces and a chipped tooth are considered minor, not always making themselves known. You also need to make sure that, no matter what other injuries you have, if you receive head trauma, you go to your local emergency room straight away. Anything else, dental emergencies included, can wait. Losing a tooth, whether it fell out on its own or was knocked out as a result of an accident, is never ideal. Before you can address the lost tooth, however, make sure your list of injuries doesn’t include head trauma. 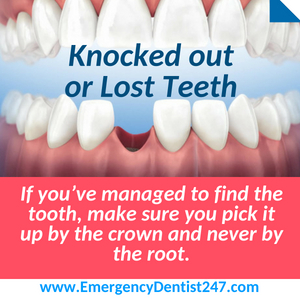 If you’ve managed to find the tooth, make sure you pick it up by the crown and never by the root. In order for the tooth to be implanted back into the socket by the emergency dentist, the root must remain as undamaged as possible. The best way to preserve the lost tooth until your appointment is to try and put it back into the socket temporarily yourself. If you can’t do so for whatever reason, keeping it in a cup of milk or water is another method you can try. Don’t try to force it back into the empty socket! 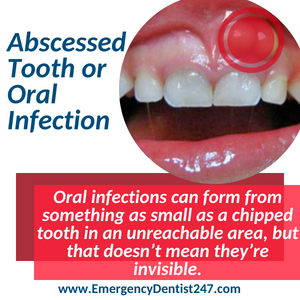 Just like a bodily infection, oral infections, such as an abscessed tooth, are dangerous. If they’re left untreated for a prolonged period of time, you run the risk of developing a life-threatening blood infection. Oral infections can form from something as small as a chipped tooth in an unreachable area, but that doesn’t mean they’re invisible. Use a compact mirror to look around your mouth. If you see anything that resembles a pimple, call us straight away. Oral infections spread through the roots of your teeth and into the surrounding tissue, causing destruction as it goes, never mind the fact that it’s a serious infection. A filling or a crown is put into place in order to protect a tooth from further damage, such as a deep cavity, for example. Unfortunately, they don’t last forever, especially if they’re aged or damaged. If you’ve lost a crown or a filling, you need to make sure you protect the tooth until you get to your appointment. Dental cement is your best bet, but you can also use a piece of gauze or a cotton ball. No matter what you use, make sure the tooth stays covered. 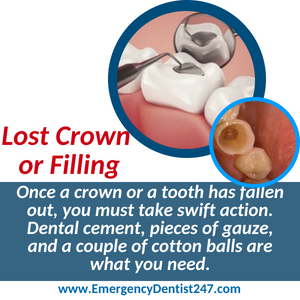 If you leave it open and exposed, you could damage it to the point of no return, resulting in the emergency dentist being forced to extract it rather than refill it or put a new crown in. Emergency tooth extractions don’t have to be a scary, unexpected experience, but they also don’t have to happen, either. The emergency dentist and their team will first do everything they can to save the tooth in question before making the decision to remove it, so keep that in mind. If it has to come out, though, just know that the extraction site will be completely numb. You’ll only feel a little bit of pressure, no pain. 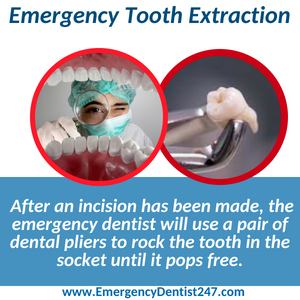 After an incision has been made, the emergency dentist will use a pair of dental pliers to rock the tooth in the socket until it pops free. If the tooth proves too difficult to remove whole, the emergency dentist will carefully, and gently, break the tooth up and remove it piece by piece. Once the tooth is removed the emergency dentist will go over aftercare instructions with you. If you want to have as minimal healing time as possible, and avoid an oral infection, make sure you follow their instructions to the letter. 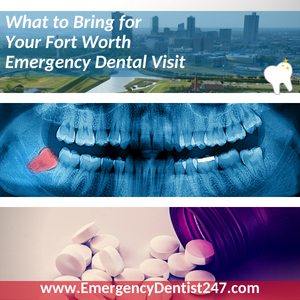 Knowing whether you need to visit the emergency room or an emergency dentist can sometimes be a very critical decision, especially if you’ve been in an accident. An emergency room doctor can treat your head trauma, major injuries, and help manage your pain. They can’t save your teeth, though. Emergency dentists can save your teeth, manage your pain to a certain extent, and can treat oral injuries, but they can’t treat head trauma. Remember the general rule of thumb – head trauma equals an immediate trip to the emergency room.